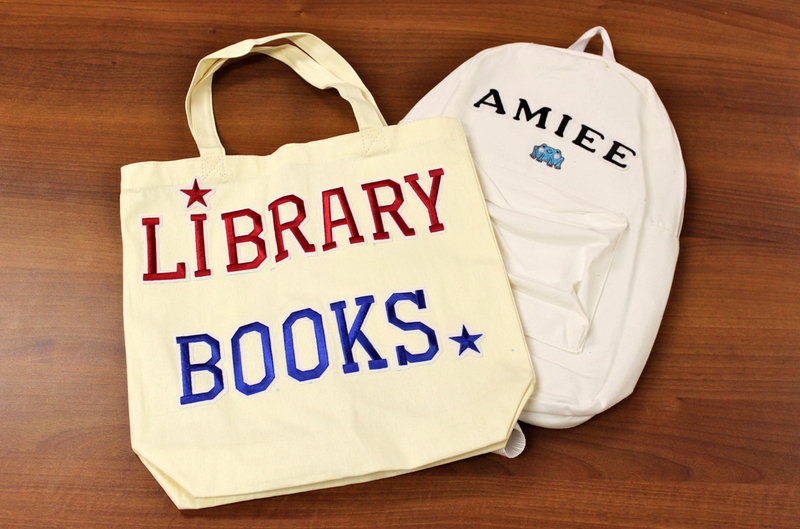 Now this is a great idea - a special tote bag designated just for the books you check out from the library. Use it to carry them home, but more importantly, use it to hold the books at home that you've finished reading until you're ready to turn them in. No more library books getting lost or mixed in with your own books and no more late fees! Another way to use embroidered iron-on letters is to add your child's name to her backpack. Perfect for making sure she comes home with the right one after school, summer camp, daycare or sleepovers. For babies, spitting and pooping are a way of life. If you're a parent (or grandparent) with a sense of humor, then put your wit into words! 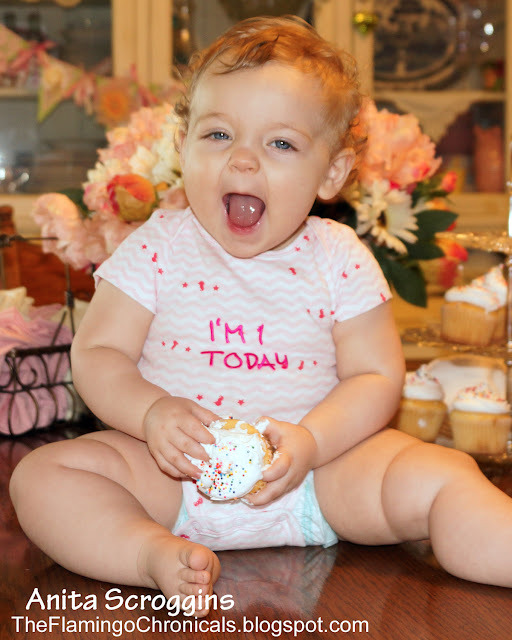 Iron-on your favorite funny sayings to baby onesies, diaper pants, bibs and more. Give the guests a giggle at the next baby shower - this is a super cute gift! Every home needs an address - even your girl's dollhouse! The mini Joy letters can be adhered to any craft surface such as this small wood plaque. 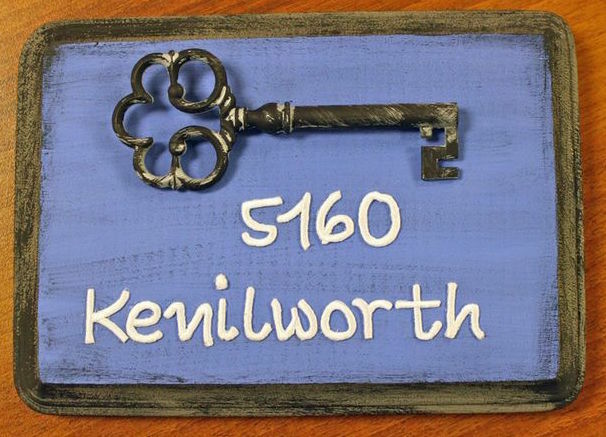 Paint it with your favorite colors and embellish it with something cute like a vintage skeleton key. Traveling this summer? This is a great time to mark your bags and suitcases with iron on letters so that they don't look like everyone else's. I put these large, white embroidered Joy letters on my boys' bags so they would be able to distinguish their bags more easily - from each other's, as well as from all the other duffel bags on the luggage carousel at the airport. You just peel, stick then iron on - what could be easier? You could even spell out a nickname or a full name. Great for all your summer travels - and not just vacation. Having personalized duffel bags is great for going to the gym, the tennis court, the bowling alley, kids' sleepovers and more. 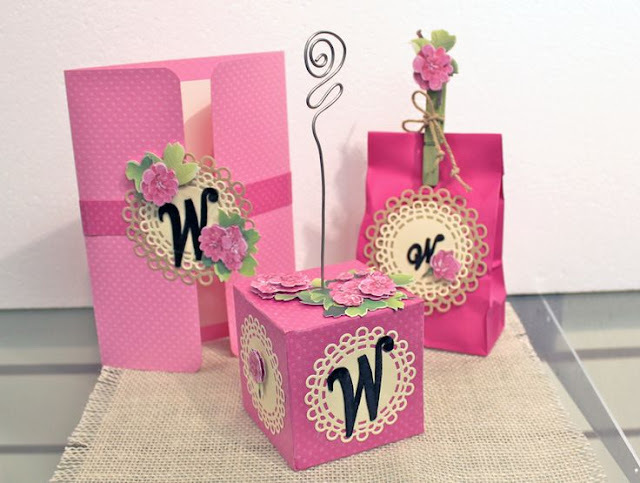 Make your next party more memorable with monogrammed party favors. No matter what the occasion, personalized parting gifts and keepsakes are really special for you and for each of your guests. Joy embroidered letters look beautiful on everything, such as the invitation, party favor bags, and place card holders. Use markers, inks or dye to tint the letters with whatever color matches your theme or décor. Party on! 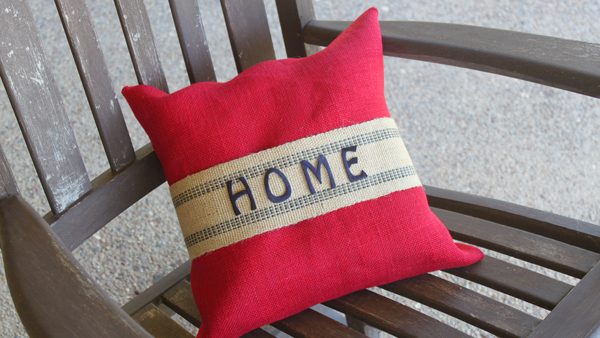 It's easy to add a personal touch to your home with a decorative pillow. Watch this short video, then check below for detailed instructions. EnJOY! 1. Cut a piece of fabric 2-1/2 times the width and the length of the pillow (about 30" square for a 12" pillow). 2. Center the pillow on the fabric, then wrap the fabric over the pillow as if you were wrapping a gift. Fold the ends toward the center then secure with hot glue. 3. Color the white embroidered iron-on letters with the brush tip of a fabric marker. You can also use an ink pad or dye. 4. 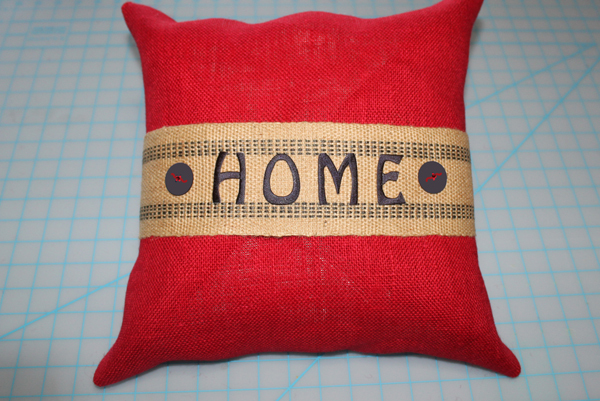 Following the manufacturer's directions, iron the letters to the center of the burlap trim. Wrap the trim around the pillow, overlap the ends at the back then secure with hot glue. Glue on buttons to accent if desired. You just can't have too many tote bags. 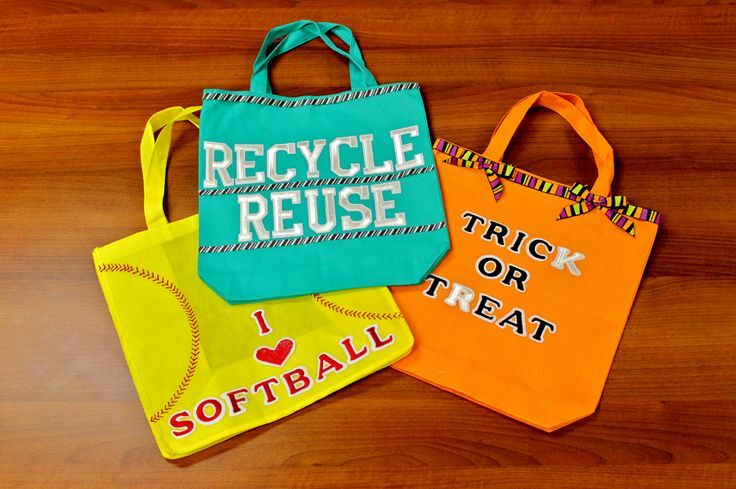 We use them for grocery shopping, carrying essentials to the ballpark or beach, and of course the holidays are filled with good reasons to tote stuff around. Pick out your favorite iron-on letters and numbers, combine them with decorative trims and fabric glue, and you can quickly create a carload of cute custom tote bags for every occasion. Every team coach needs a clipboard, right? 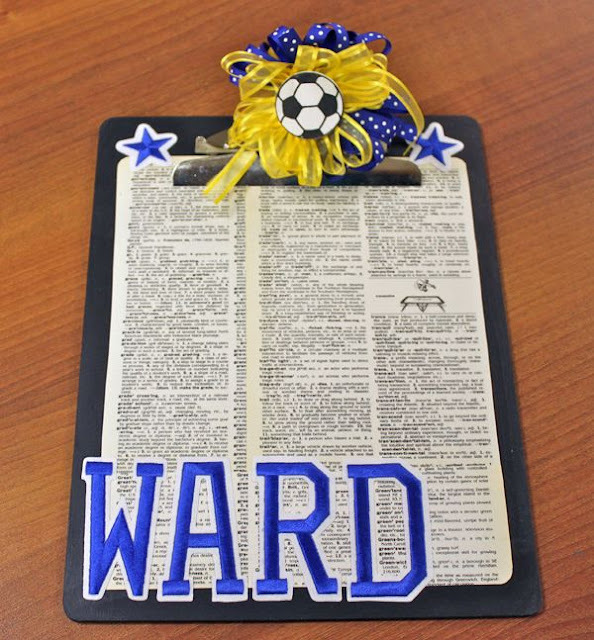 Decoupage a plain wood clipboard - we love this idea of using pages from an old dictionary. Then glue on Joy embroidered letters at the bottom to spell the name of your coach, team or school. Embellish with sports-themed stickers and die-cuts in your team colors. What a great gift....SCORE! 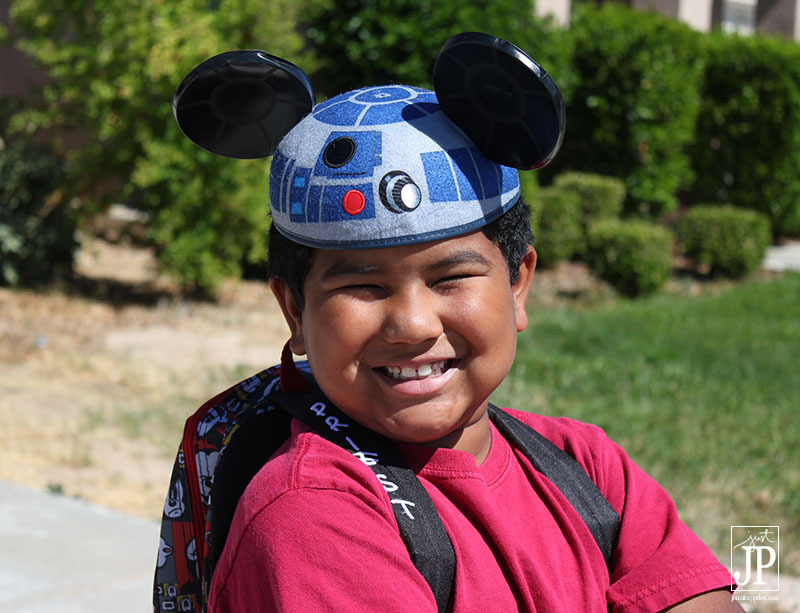 We love going to amusement parks like Disneyland in Southern California. Many amusement parks and resorts offer special deals, like this backpack we recently got at Disneyland earlier this year. But with a sale price, that means everyone has the same backpack, so sometimes it's hard to tell ours apart from the same backpacks that our friends bring to the park! 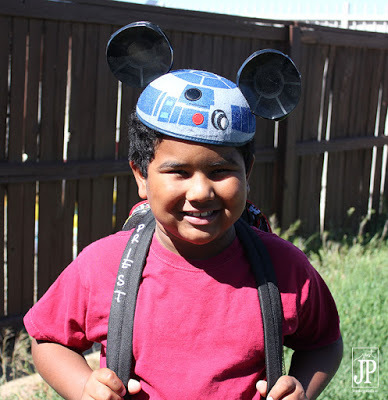 When I received the JOY Baby Monogram Letters and Numbers, I knew they would be perfect for customizing our Disney backpack. We chose to put our last name on the shoulder strap so we'd always know which backpack was ours. The process was incredibly easy and fast! The cartoon font of the Baby Monogram Letters is perfect for an amusement park backpack. You can use the same technique with any of the JOY letters to customize a backpack or ruck sack for camp. And with back to school coming up, these letters are a great way to add your child's name to their bag with class. Thanks so much for stopping by the Creating with Joy blog today! Be sure to follow us on Facebook for more inspiration and projects. For more creativity, visit me over at Just JP. 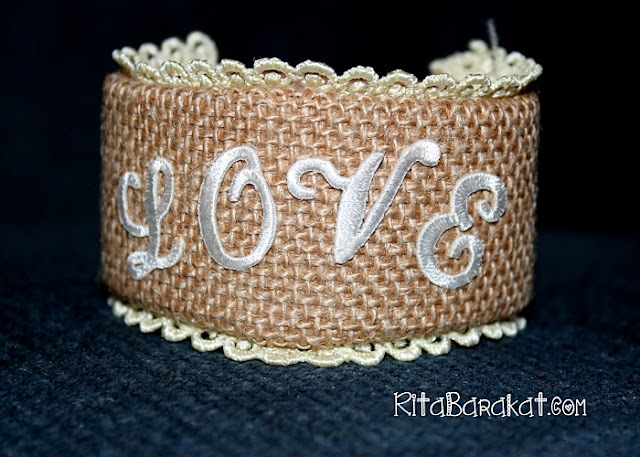 How about making this sweet little cuff bracelet for a quick gift that's sure to be cherished? 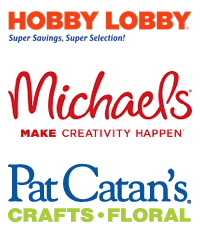 It's easy to customize by adding your favorite word or initials with Joy iron-on letters. Start with a readymade leather bracelet from the craft store (there are different sizes so check your wrist). I covered both sides of the bracelet with extra-strength double-sided adhesive tape (don't cover the area with the snaps), then pressed a scrap of burlap down on top. I folded the excess burlap around the edges and pressed against the adhesive on the back. I glued some lace trim that was just a bit wider than the bracelet to the back, which feels nicer against your skin than the burlap. Lastly I ironed the letters spelling "love" on to the burlap in front. This leather bracelet was super easy and fun to alter and wear! My little Miss Muffet does enjoy a fluffy tuffet! 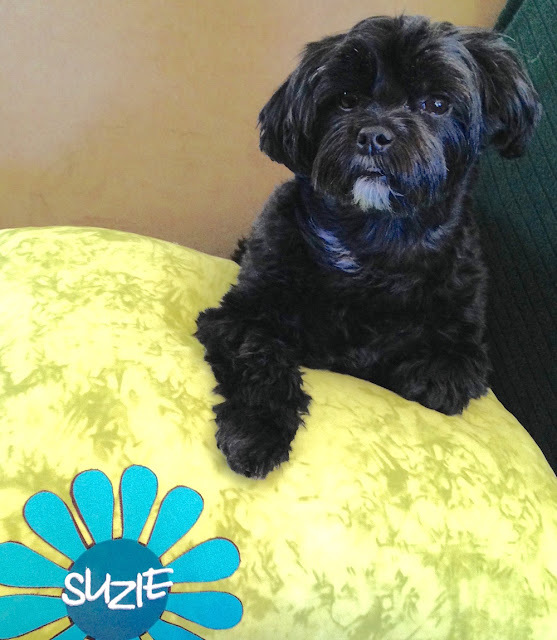 You can easily personalize any pillow for your pet. Whether you're stitching up a pillow cover from scratch or embellishing a readymade pillow, Joy letters are super quick and easy to work with. I cut a square of fabric with a blue flower in the center and pressed it against a sheet of double-stick fabric tape, leaving the back paper liner in place. After fussy-cutting around each petal, I removed the liner, a few petals at a time, and pressed the flower into place on the front edge of the pillow. Then I added her name in small white embroidered letters with fabric glue. Some fabric adhesives can go through the wash on the gentle cycle, but since this pillow will only be used for her occasional car rides, I think spot-cleaning as needed will be fine. She certainly looks like she owns it, doesn't she? 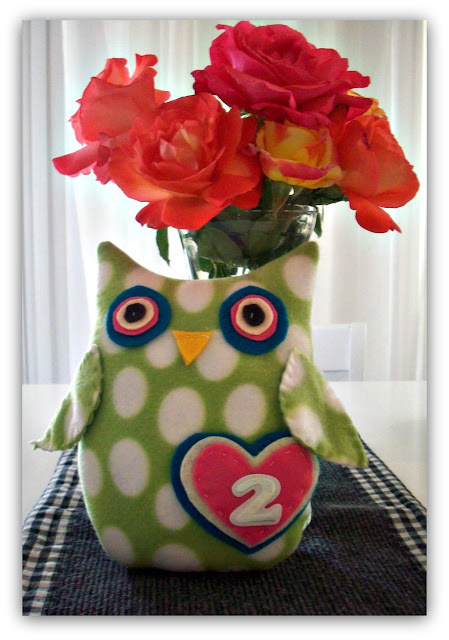 Ever wonder what to do with scraps of fleece that are leftover after completing a project? 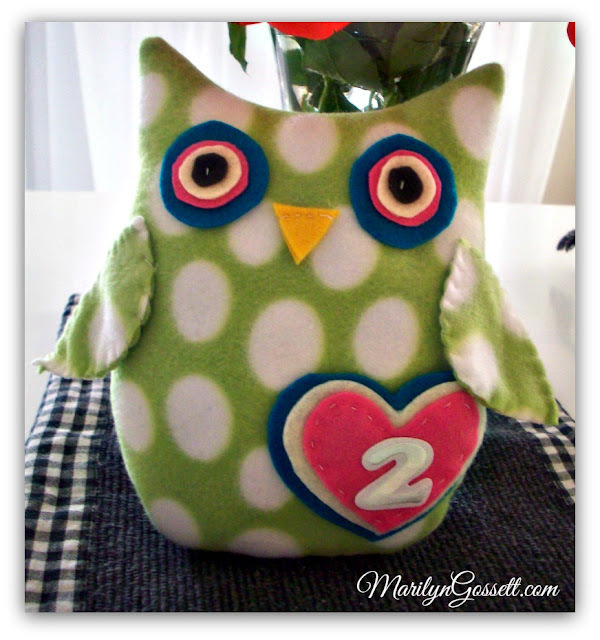 I had some yardage left and made this baby-friendly plush owl. An iron-on number by JOY reflects the child's age. Alphabet letters for initials work here too! 1. Print and cut out my pattern. Cut two 12" square pieces of fleece and lay them down together, right sides facing in. Lay the pattern on top of the layers and trace around it on to the fleece. 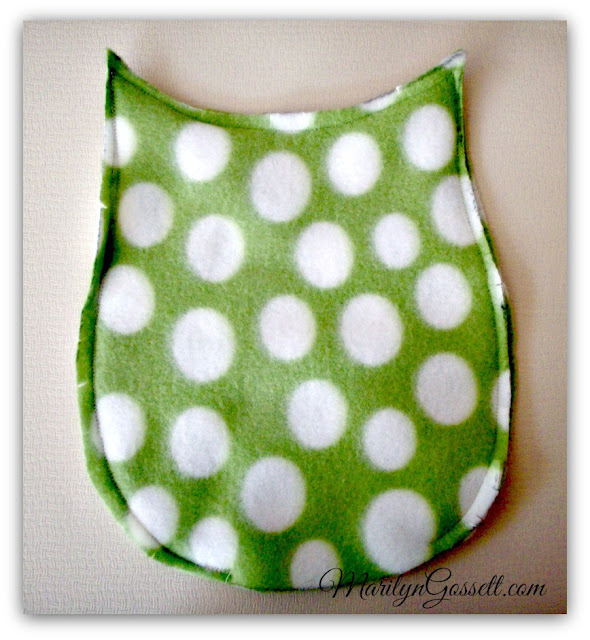 Remove the pattern, cut out the owl and pin the fleece together and sew a 3/8" seam around the owl, leaving an opening in the bottom. 2. Cut little snips into the seam allowance (careful not to cut through the stitching) around the curves. 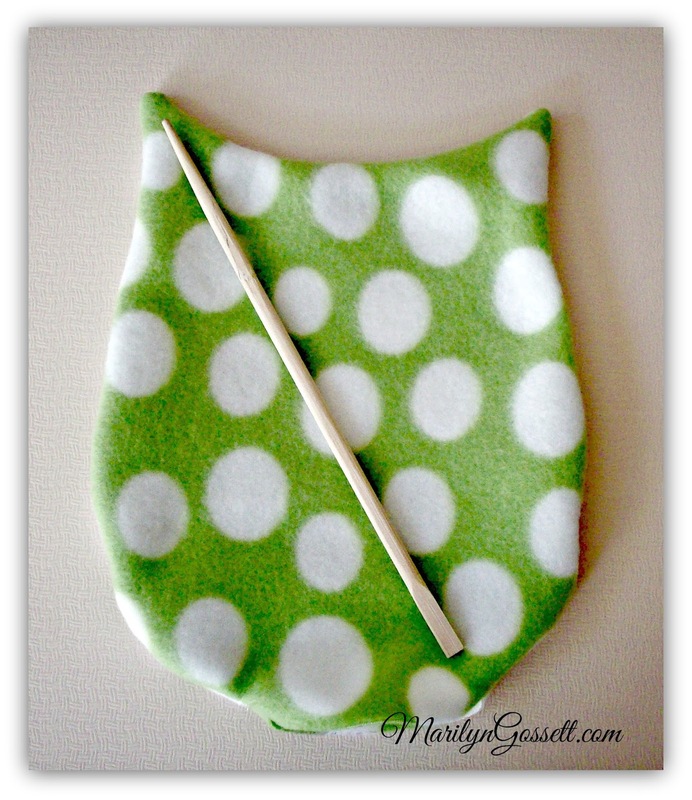 Turn the owl right side out, using the chopstick to push out the points in the ears. 4. Fill the owl with fiberfill. Use the chopstick to get it into the small areas. Turn in the seam of the opening and whipstitch it closed. 5. 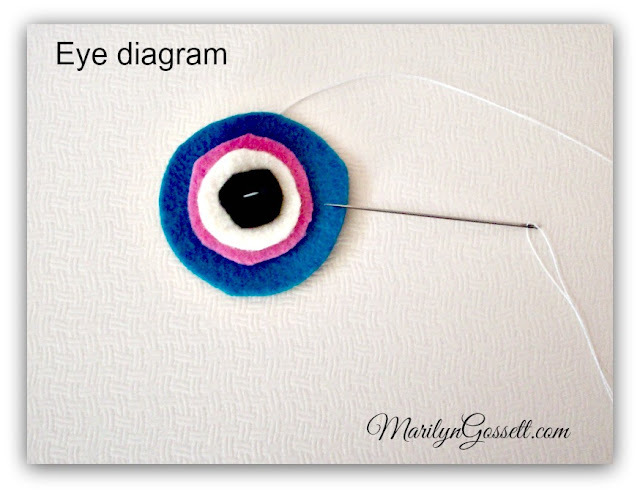 For the eyes, cut a pair each of the following sizes of felt circles: turquoise: 1-3/4"; pink: 1-1/4"; cream: 1"; brown: 1/2". Stack the circles from largest to smallest and stitch them together. 6. For the beak, fold a piece of yellow felt in half and cut a small triangle with the fold at the bottom. Stitch along the top edge to attach to the owl as shown. 7. For the wings, layer two pieces of fleece for each wing and cut out using the pattern. Reverse the pattern and repeat for the second wing. Stitch around each wing using a whipstitch or a blanket stitch and attach the wings to the owl with a couple small stitches. 8. Cut out three felt hearts: 4" turquoise; 3.5" cream, 3" pink. Layer the hearts as shown and attach by sewing a running stitch around the inside of the pink heart. 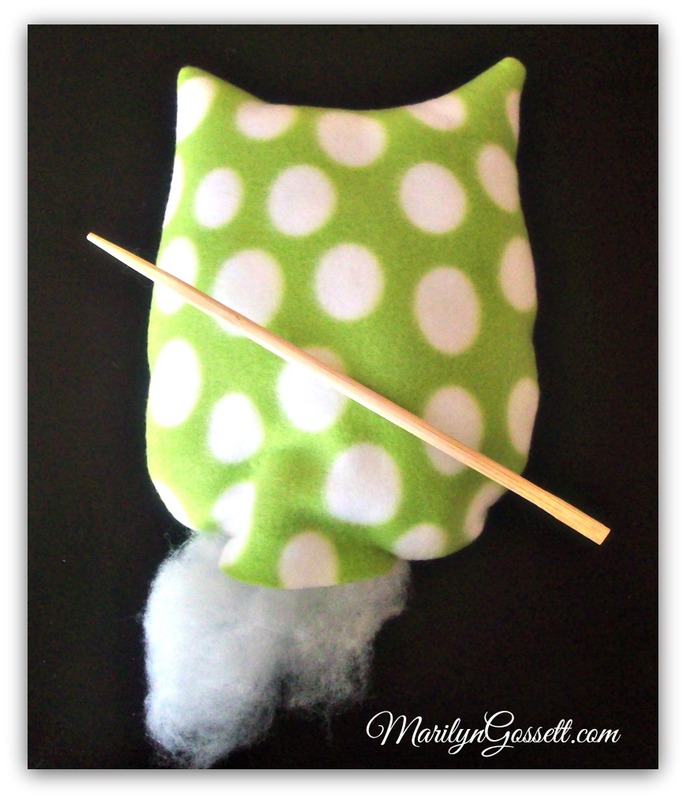 Attach to the owl with a couple stitches, leaving the middle open for a little pocket. 9. 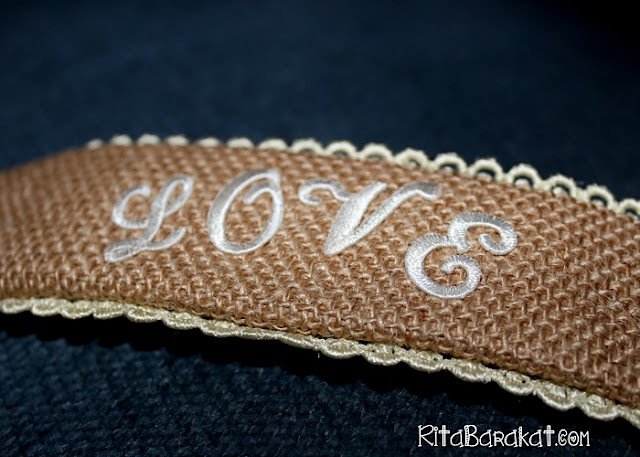 Follow the manufacturer's directions to iron-on the embroidered number to the heart. The Princess (aka my grandaughter) will be one year old very shortly (which I can't believe!) and of course she will need something to wear while eating cake. Out came my iron-on letters from Joy, of course. Here she is in her custom made onesie, digging into some cake! I used the Baby Monogram letters and numbers and dyed them to match the onesie. I wanted to make something quick and simple, since she will probably only wear this once. 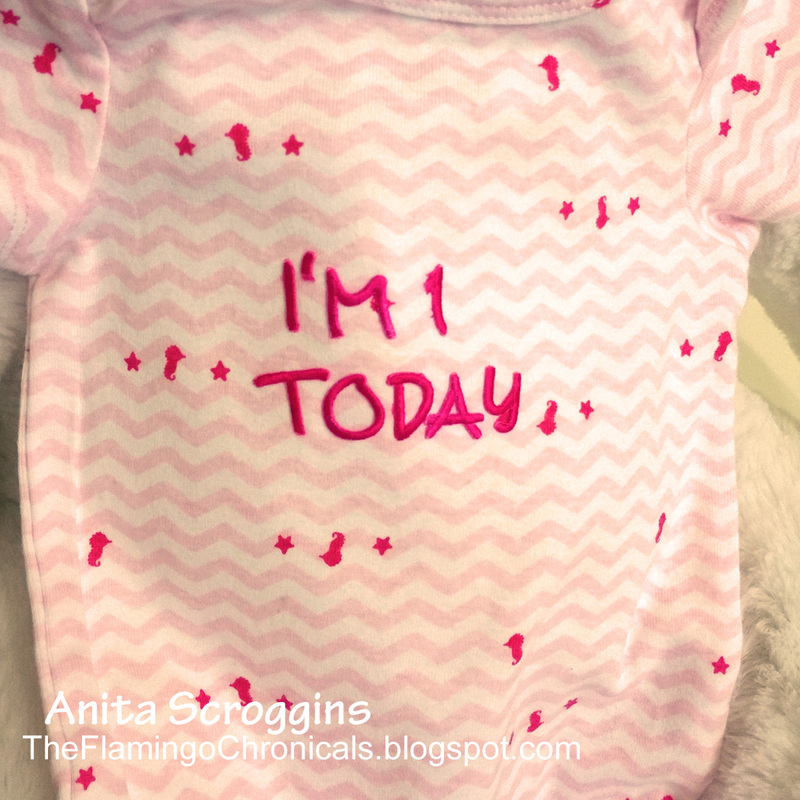 Personalizing this baby onesie took all of fifteen minutes, and that included the time for the letters to dry after dying! 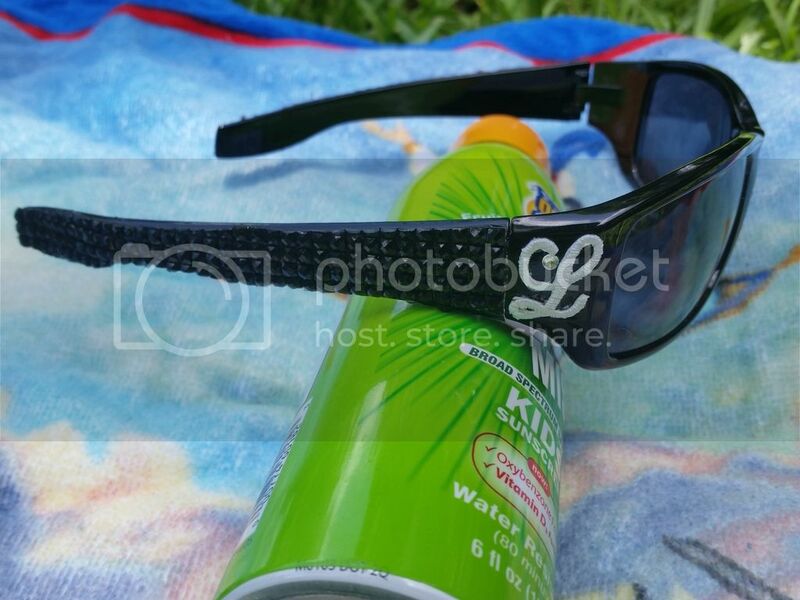 Summer is here - which means heading out to a pool or beach! 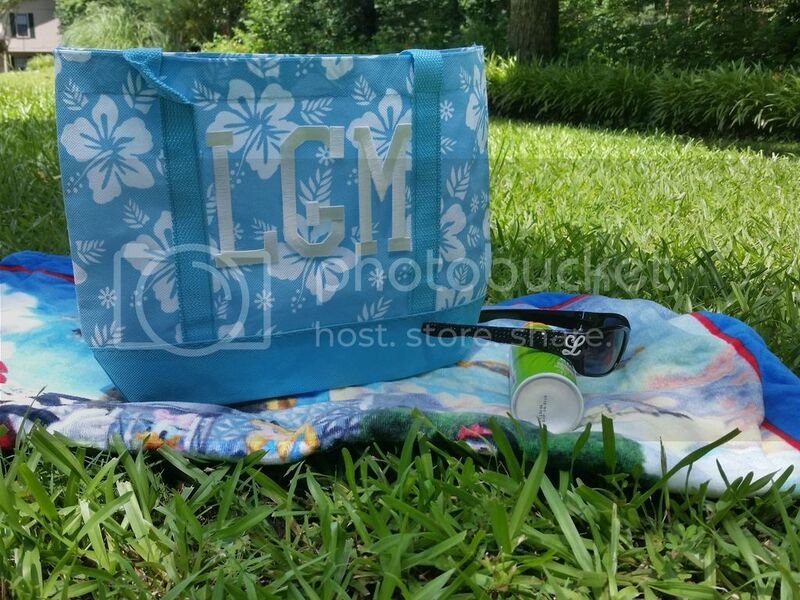 Using Joy letters, I have personalized two basic summer essentials - a tote bag and sunglasses. And who needs to spend a lot to look great? These items came from the dollar store! Even though the Joy letters that I used are really iron-on letters, I didn't iron them on! Click here to see how I was able to make these letters work with adhesive instead of an iron.